Madagascar is one of the world's richest nations in biodiversity but they may not be able to carry that title for much longer. One of their most famous animals, the lemur — a primate found only on the east African island, is under threat. And without immediate action, nearly every species of lemur could be lost. 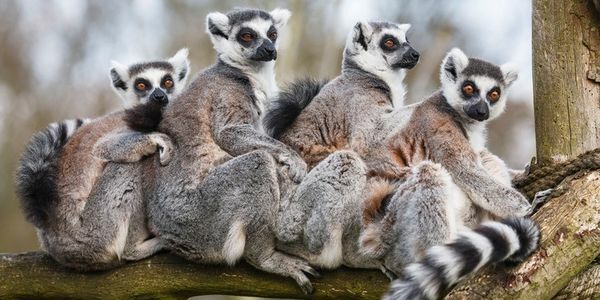 According to a new study, of the planet's more than 110 species and subspecies of lemur 105, a full 95% of them, qualify as critically endangered, endangered, or vulnerable to extinction in the wild; making them the most at risk mammal on the planet. Lemurs are under attack from all sides. The island nation has lost nearly 80% of its forests since the 1950s. One study suggests that between 2005 and 2013, 2.47 million acres of forest were cut down. That's an area only slightly larger than the island of Puerto Rico. With so much deforestation, the lemurs are losing habitat at an exacerbated rate. What's more depressing is that while they are losing habitat due to logging, mining, and agriculture, they are also being hunted for food. They are killed for bushmeat by villagers but are also sold in some of the country's nicer restaurants in urban areas. Restaurant-goers can use special code words to order the dish that is technically illegal albeit all too abundant. It's time for Madagascar to ask itself, do they want to be the nation that let their own, unique natural heritage disappear from the Earth when they had a chance to stop it? Are they willing to take conservation seriously in order to save this unique species and ensure that it can live on for centuries?